Blueberry Swirl Crumb Coffee Cake. Blueberry sauce is swirled into tender butter cake and topped with a generous layer of New York style crumbs for a blueberry crumb cake that’s perfectly at home at the breakfast table, next to your afternoon mug of coffee or tea, or sliced up and served for dessert after dinner. 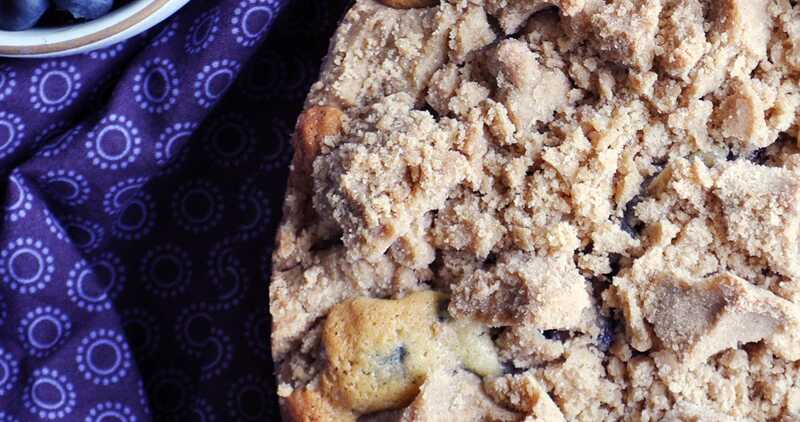 Is this blueberry crumb cake best eaten at breakfast, as a mid-afternoon snack, or for dessert? For Easter or Mother’s day brunch? On lazy Saturday mornings? As a late night snack? 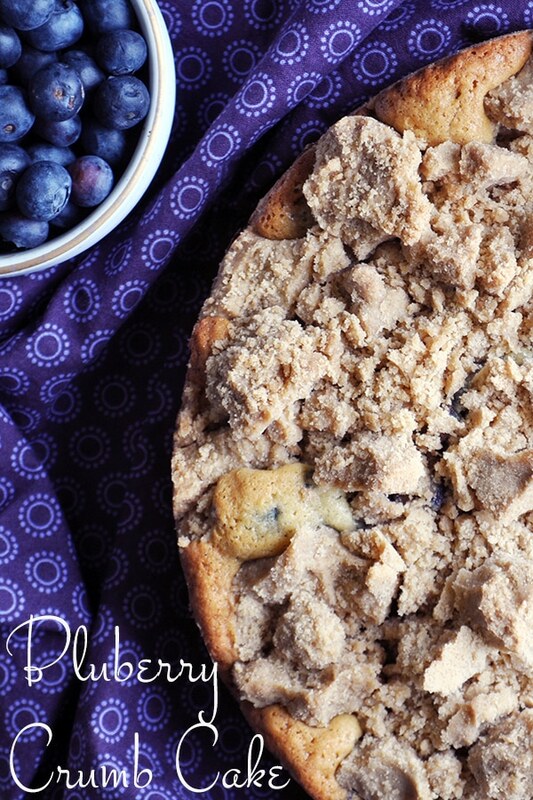 This blueberry crumb cake is one of those unique treats that feels appropriate pretty much any time of day or night. 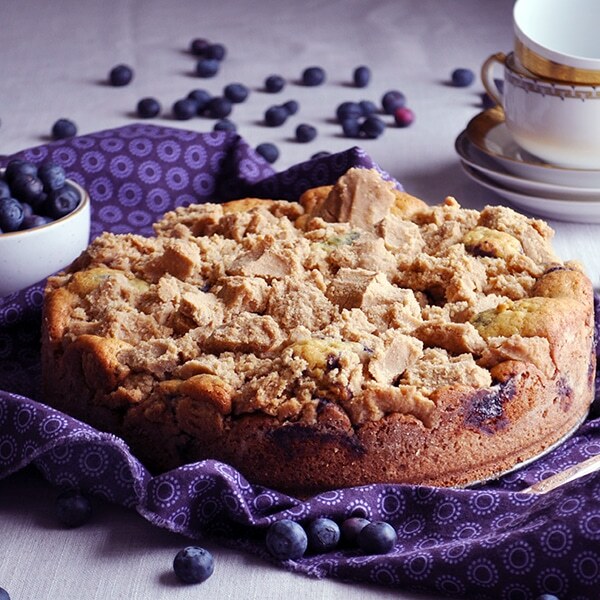 Is it a coffee cake? Snack cake? Dessert cake? Whatever you want it to be, that’s what it is. If only more things in life were that way. People, clothes, cars, kids, jobs, family gatherings, holidays, vacations … how awesome would it be if everything was whatever we wanted it to be in that moment? As I write this, it occurs to me that this can be true as long as I adjust what I want to the reality of this. present. moment. How very Zen of me. I think I could be Zen more often if the reality of every moment involve cake. Just sayin’. The Problem with Blueberry Cake. The problem, as I see it, with many blueberry cake recipes, is that whole blueberries don’t hold up well to a long baking time. They end up tasting a bit soggy. 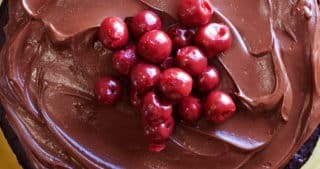 Also, if the blueberries you’re using aren’t perfectly ripe and sweet, you end up with forkfuls of cake studded with soggy, bland blueberries. To avoid this situation, I started out by cooking some blueberries with a bit of sugar and lemon into a thick blueberry sauce before swirling it into butter cake batter. Then, I topped it with a lot of rich, buttery crumb topping. 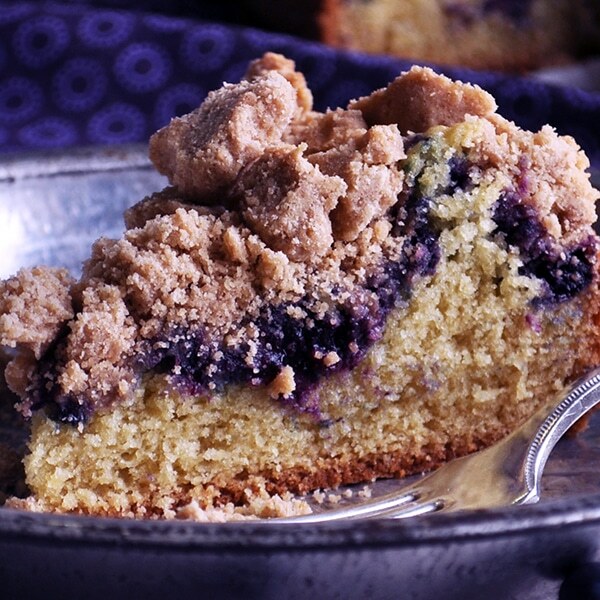 The result is a tender, moist cake, flavored with swirls of slightly sweet, flavorful blueberry sauce, and plenty of buttery crumb topping on every fork full. 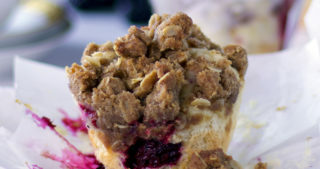 Big, Fat, Buttery Brown Sugar New York Style Crumbs. 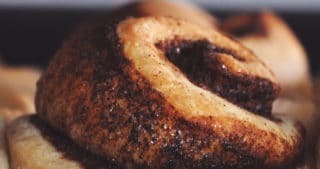 I’m a sucker for a good crumb cake – “good” being defined as a whole lotta crumb in proportion to cake. Also, I feel strongly that there should be a lot of butter and brown sugar involved. My other preference is to top cakes with big, fat crumbs that are practically the size of small cookies. 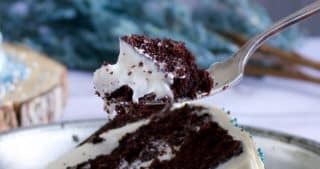 To get those big crumbs, just squeeze the crumb topping together in your hand as you add it to the top of the cake batter. If you prefer a delicate, loose crumb topping, just break the crumbs up as you sprinkle them on the cake. That’s good too. 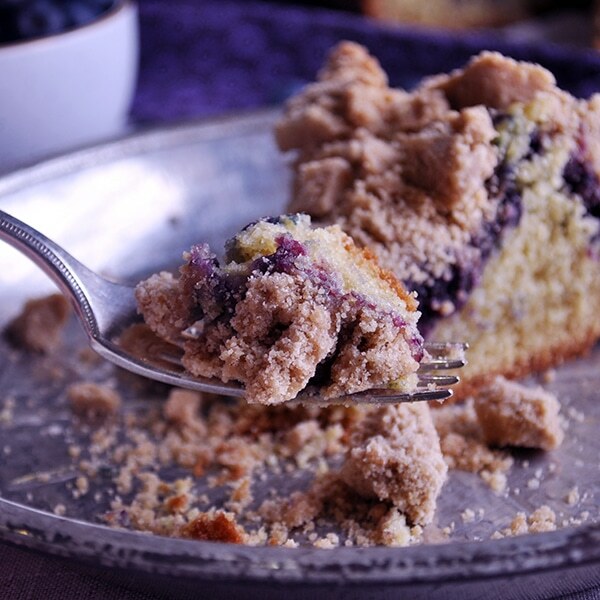 Blueberry sauce is swirled into tender butter cake and topped with a generous layer of New York style crumbs for a blueberry crumb cake that’s perfectly at home at the breakfast table, next to your afternoon mug of coffee or tea, or sliced up and served after dinner. 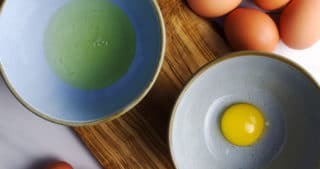 Add all blueberry swirl ingredients to a small saucepan and heat over medium heat, smashing some of the berries against the side or bottom of the pan with a fork or pastry cutter. Bring the mixture to a boil and continue to cook over medium heat, stirring frequently, for 10-15 minutes, until the mixture is thickened. If you drip some onto a plate, the blueberry sauce should hold it’s shape. Add both sugars, cinnamon, salt, and melted butter to a medium size bowl and whisk vigorously to combine. Whisk the flour and cornstarch together and add to the butter and sugar mixture. Using your hands or a rubber spatula, rube the flour into the butter until completely moistened. Cover and set aside. Preheat your oven to 325 degrees. 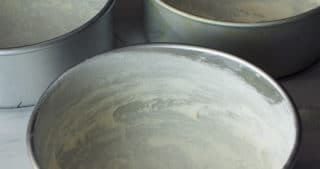 Grease a 9 or 10-inch springform pan and cover the bottom of the pan with parchment paper. Shake some flour around inside the greased pan to coat completely. Add the flour, cornstarch, sugar, baking soda, and salt to the bowl of an electric mixer fitted with the paddle attachment. Mix on low just to combine. With the mixer running on medium-low speed, add the butter, piece by piece, mixing until the butter is completely incorporated into the flour and the mixture looks like coarse crumbs. 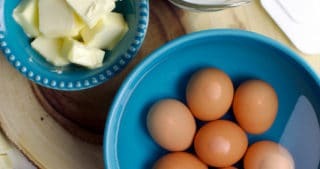 Add the eggs and egg yolk, buttermilk. and vanilla and beat on medium speed for 1 minute to combine. Scoop the batter into the prepared springform pan and smooth into an even layer. Drop spoonfuls of blueberry sauce all over the top of the cake batter. 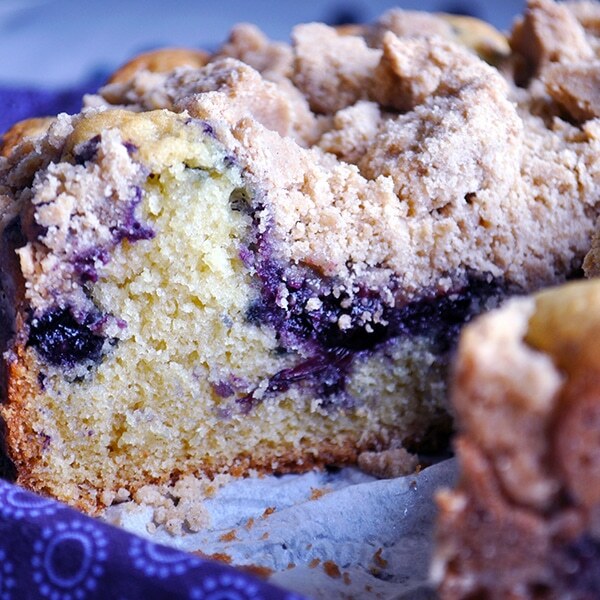 With a butter knife, swirl the blueberry sauce into the cake batter. Sprinkle the crumb topping over the top of the cake, squeezing it in your hands as you do to create large pieces of crumb. 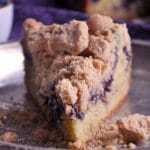 Bake the blueberry crumb cake for 60-70 minutes. The cake is done when a toothpick inserted in the center comes out without any raw batter on it. 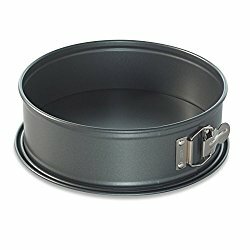 Remove the cake from the oven and allow to cool on a wire rack for at least 15 minutes before removing the sides of the springform pan. Serve warm or at room temperature. 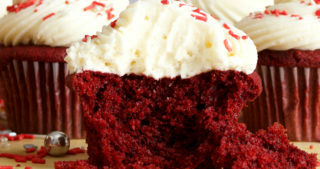 The cake will keep in an airtight container at room temperature for up to 2 days.